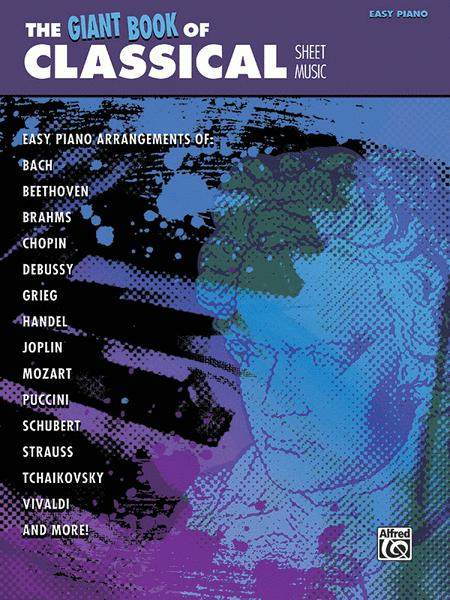 With more than 80 essential masterworks arranged for easy piano, this book guarantees a lifetime of exploration and enjoyment at the keys. Titles: 1812 Overture (Tchaikovsky) * Air on the G String (Bach) * Andaluza No. 5 (Granados) * Anvil Chorus (Verdi) * Ave Maria (Bach-Gounod) * Ballade No. 1 (Chopin) * Barcarolle from Tales of Hoffmann (Offenbach) * The Blue Danube (Strauss) * Brandenburg Concerto No. 3 (Bach) * Bridal Chorus, from Lohengrin (Wagner) * Can-Can (Offenbach) * Canon in D (Pachelbel) * Clair de lune (Debussy) * Doretta's Song (Puccini) * The Entertainer (Joplin) * Egmont Overture (Beethoven) * Eine kleine Nachtmusik (Mozart) * "Emperor" Concerto (Beethoven) * Fantaisie-Impromptu (Chopin) * Flower Duet (Delibes) * Funeral March of a Marionette (Gounod) * The Garland Waltz, from Sleeping Beauty (Tchaikovsky) * Habanera (Bizet) * Hallelujah Chorus (Handel) * Hornpipe (Handel) * Hungarian Dance No. 5 (Brahms) * Intermezzo (Mascagni) * In the Hall of the Mountain King (Grieg) * Jesu, Joy of Man's Desiring (Bach) * L'Arlesienne Suite No. 1 (Bizet) * La ci darem la mano (Mozart) * La donna e mobile (Verdi) * Libiamo, from La Traviata (Verdi) * Mandolin Concerto in C Major (Vivaldi) * Maple Leaf Rag (Joplin) * March from The Nutcracker (Tchaikovsky) * March of the Toreadors (Bizet) * Meditation, from Thais (Massenet) * "Merry Widow" Waltz (Lehar) * "Military" Polonaise (Chopin) * "Minute" Waltz (Chopin) * The Moldau (Smetana) * "Moonlight" Sonata (Beethoven) * Morning Mood (Grieg) * Musetta's Waltz (Puccini) * "New World" Symphony (Dvorak) * Nocturne, Op. 55, No. 1 (Chopin) * O mio babbino caro (Puccini) * Ode to Joy (Beethoven) * Overture from The Marriage of Figaro (Mozart) * "Pathetique" Sonata (Beethoven) * Pavane (Faure) * Piano Concerto No. 1 (Tchaikovsky) * Piano Sonata No. 11 (Mozart) * Polovetsian Dance (Borodin) * Pomp and Circumstance (Elgar) * Prelude from Cello Suite No. 1 (Bach) * Prelude, Op. 2.